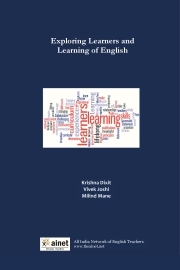 Description of "Exploring Learners and Learning of English"
This volume contains articles on research studies and classroom experiments and experiences in understanding learners and learning of English, while some focus on aspects of and issues in teaching English. All articles come from practicing teachers and represent a wide range of contexts, communities of learners and classroom conditions. The articles present a mix of practical and theoretical ideas and concerns. This volume offers useful ideas and valuable insights on ground-level issues in English language education in India. Krishna K. Dixit teaches English language and literature courses in Yeshwant Mahavidyalaya, Seloo (Wardha) and is also a freelance teacher trainer. He is the National Coordinator of AINET. Dr. Vivek Joshi is an Assistant Professor, Department of English, Gondwana Univeristy, Gadchiroli. He is interested in Indian writing in English, assessment practices, networking and teacher development. He is an executive member of AINET. Milind Mane works as an Assistant Professor is SJGS College, Pipri (Wardha). His interests are classroom interaction, teacher education and the use of technology in teaching. He is an executive member of AINET. Reviews of "Exploring Learners and Learning of English"